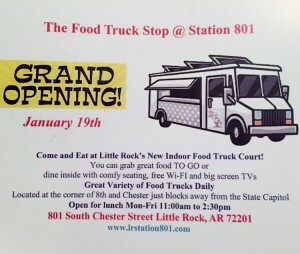 Join us January 19, 2016, from 11:00 AM -2:30 PM for the GRAND OPENING of Little Rock’s first of it’s kind Food Truck Stop. Come out and choose from 5-7 different food truck vendors. Relax in an indoor open seating area while you eat. LR801station has plenty of on-site parking, and the facility is equipped with Wi-Fi and flat screen televisions, that makes this a great place for a food break.